Second visit to the library this month. This time, I really could've used Matilda's wagon. In my last library haul, I checked out 8 books and was able to finish 5 of them in three weeks. I found it was especially difficult because I also have purchased books that I want to get to as well. This faces me with the dilemma of library due dates versus what I actually feel like reading. 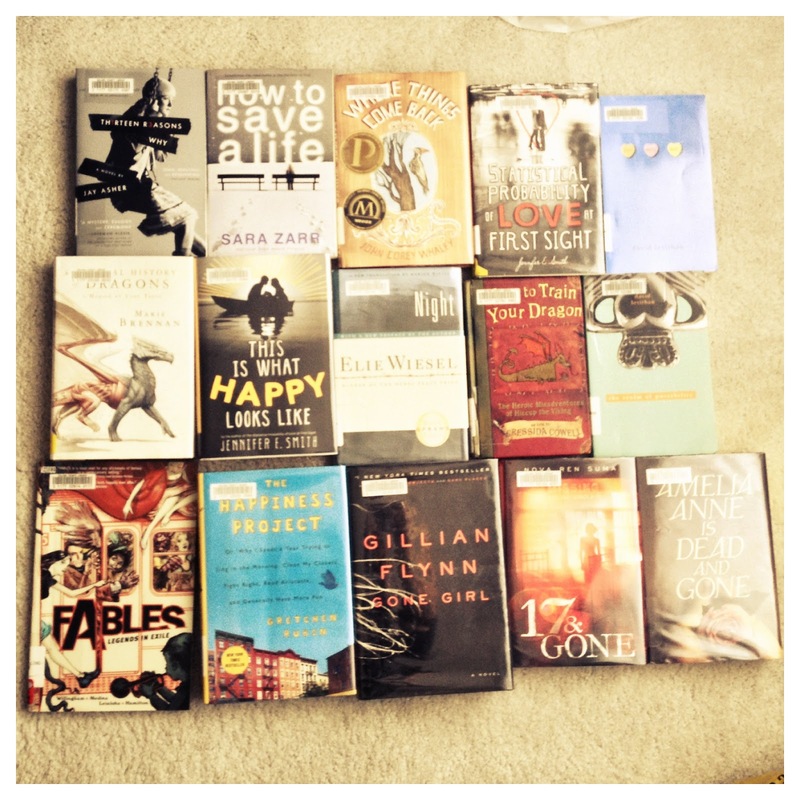 I recently went back to the library and checked out 15 books (plus 1 e-book and 1 dvd). As I walked out of the library with my plastic bad loaded to full capacity, and several books in arms, I realized I have reached the highest level of book hoarding. There is no way I can finish all 15 (in addition to the ones I renewed from the last haul) in 3 weeks. But I'll admit, when I unloaded the bag on my bedroom floor and spread them all out, I was filled with great zeal at all my choices. I really got a great selection this time and it's going to be so much fun getting to decide which ones get read first. I'm going to start this haul by including what I renewed/returned from my last book haul. My main reason for returning this one is because I have yet to read its predecessor, 13 Little Blue Envelopes. I figured I'd borrow it again once at least finish its predecessor first. Amazing selection!!! So many I wish to read myself! 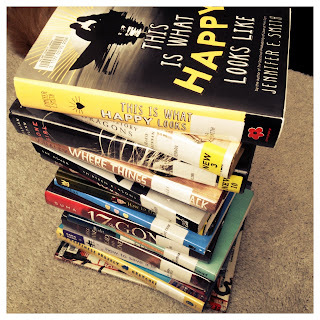 Highly anticipating your thoughts on : Thirteen Reasons Why, How to Save A Life, Where Things Come Back, Boy Meets Boy,This Is What Happy Looks Like, Night, The Realms of Possibility��, The Happiness Project. I have been wanting to read The Art of Fielding too! After reading your comment, I may just have to get it in my next purchase.